"Whatever your experience, expertise and specialism, Delay and Disruption in Construction Contracts is an authoritative reference resource for all construction law practitioners. It not only provides comprehensive coverage of all aspects of its title subject, but also covers the historical background, compares some 97 different standard form contracts, and discusses case law from a variety of jurisdictions." "The book remains the standard point of reference for construction professionals and legal practitioners when any of the issues which it deals with arise." Delay and disruption in the course of construction impacts upon building projects of any scale. Now in its 5th edition Delay and Disruption in Construction Contracts continues to be the pre-eminent guide to these often complex and potentially costly issues and has been cited by the judiciary as a leading textbook in court decisions worldwide, see, for example, Mirant v Ove Arup  EWHC 918 (TCC) at  to  per the late His Honour Judge Toulmin CMG QC. Updated case law (to December 2014), linked directly to the principles explained in the text, with over 100 helpful "Illustrations"
Bespoke diagrams, which are available for digital download and aid explanation of multi-faceted issues This book addresses delay and disruption in a manner which is practical, useful and academically rigorous. 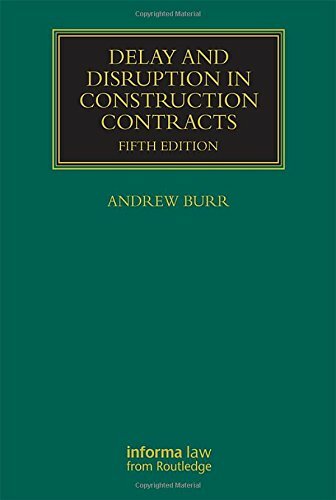 As such, it remains an essential reference for any lawyer, dispute resolver, project manager, architect, engineer, contractor, or academic involved in the construction industry.